Best Moment this week: Getting rest and things done while my parents kept Harper - such a blessing! I've reached the point where strangers are commenting on how big I am. ha! 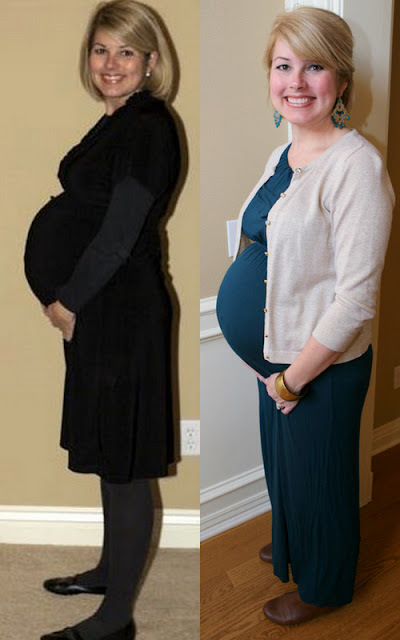 I went a few places yesterday and several people walked up to me and said "Wow - you are ready to pop" or "Whoa - you've gotten big since the last time I saw you (said the T J Maxx girl) ha!" I told Scott that when people ask me when I'm due out in public - I'm SOOOOO tempted to say "What do you mean? I'm not pregnant?" ha ha ha ha! Just to enforce the rule that you NEVER ask unless you know for sure! ha! ha! I've shared bits and pieces but as of last night Hollis' nursery is finally finished! So I thought I would share! Looking in the room from the outside - I know these aren't typical girl colors but I LOVE how it turned out. My friend Amanda made the cornice board that is hanging above the drapes. I love how it turned out!!! I had her bedding made at www.polkatotdesigns.com and I think it's just perfect. Harper thinks so too - she climbs up in this bed at least 100 times a day. I can't keep her out of it. ha! One side of her closet with her 0-3 months clothes hanging. Almost all of these were Harper's but I have bought a few new things for Hollis. (Several with her name on them - how could I resist?) ha! I want her to have a few things that were just her own!